Joomla Virtuemart Product Custom Video: Joomla Virtuemart Product Custom Video, is a unique and remarkable Virtuemart addon, with the help of this plugin admin, can add product description videos or tutorial video in case of machinery item(s).This is plugin both the custom and YouTube video can be added to the storefront view and in Virtuemart product detail page. This plugin increase sales volume opportunity, since the product video demonstration or product video advertisement, plays an important role in increasing the sale of the product through better promotional impact. Store admin can set autoplay option for each product video. 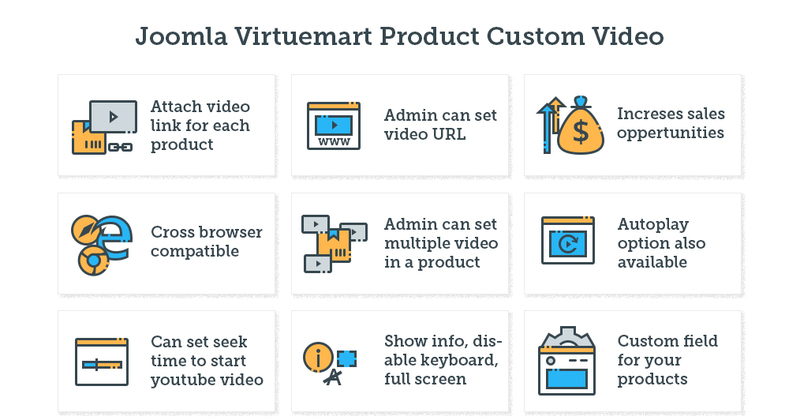 Did you buy Joomla Virtuemart Product Custom Video? Excellent - exactly what I wanted for my Virtuemart Store! Very easy to install. Had a few questions re api and correct naming of url to Youtube, but it was my user error. Polite, speedy, excellent and patient. It's always a learning curve and I appreciated the very professional and friendly assistance. Excellent. I had to explore the api set up but it was simple once I was pointed in the right direction. I could have explored other avenues to get a video in the product page as I wanted but for the price/efficiency this plug is was good value.